Sorry for the silence this last month, but I've been super busy with commission work. 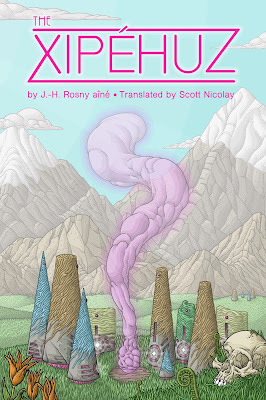 I just finished the cover for Scott Nicolay's translation of J.-H. Rosny aîné's The Xipéhuz! I also just finished an overhaul of my illustration website. You can find more info on my cover for The Xipéhuz, as well as years worth of archives, at the new Last Chance Illustration site. I'm also excited to say that I only have a single H.P. Lovecraft creature remaining to complete my Illustro Obscurum project....and it's a biggie! Expect it soon, along with a few redrawings of older dudes. As to the future of this blog, don't worry. I'll continue to illustrate monsters and gods from other weird fiction authors once Lovecraft is finished.